At the World Economic Forum’s annual meeting, much of the conversation surrounded trade deals – particularly between the United States and China, the record-breaking U.S. government shutdown, and of course the eternal enigma of Brexit. But amid the hand wringing and the worrying about who had and hadn’t turned up in Switzerland, two persistent strands caught my eye: the environment and food security. On the first day at the Forum, Prince William and Sir David Attenborough had one of the best attended and most memorable discussions of the week, addressing the plight of the natural world. “The Garden of Eden is no more,” the world’s most beloved and celebrated naturalist told delegates. Extreme weather events, rising seas, droughts, forest fires and other natural disasters have been high on the news agenda in recent years, while politicians squabble over what to do about them. There’s an irony here of course. The biblical Garden of Eden was lost to humankind when Eve took a bite of forbidden fruit from the tree of knowledge. But knowledge, or rather lack of it – or at least disagreement over the facts – is at the heart of the issue of climate change. Scientists may be in lock step over humankind’s role in climate change, but political unity on the same topic is in short supply. 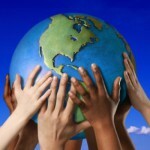 At the same time, there is a related, universal and fundamental issue emerging. This confluence of natural and political factors is combining to exacerbate very serious challenges in food security. Put simply, if the Garden of Eden is slowly being destroyed, what will be left behind for people to eat and drink? Many, including the UN’s World Food Programme, have explicitly made the link between climate change and food security. Half of the WFP’s emergency operations in the last decade have been due to climate-related disasters, and the organisation estimates that US$23 billion has been spent on climate-related food crises. During the week we also heard of the plight of those suffering from famine in Yemen, whose access to food aid is – the WFP reported – being used as a weapon by the Houthis in the conflict. 18 million Yemenis – some 60% of the country’s population – are food insecure, we learned. It is a desperate situation. On my show, Connect the World, I also discussed the fact that the issue of guaranteeing access to safe, nutritious, affordable food is not confined to poorer countries. 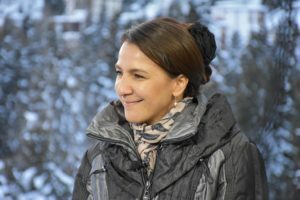 I interviewed Mariam Al Mehairi, the UAE Minister of State for Food Security (pictured above), who gave CNN’s viewers an eye-widening statistic: the UAE imports 90% of its food, so while it might surprise people that the country even has a minister for food security, the need is clear. Al Mehairi told me that the UAE is focused adopting technology and enhancing the R&D agenda for food security. Agriculture technology and issues such as reintroducing legacy crops are at the centre of the country’s strategy as it looks to shore up its own resources and access to food. It’s an interesting area that I intend to follow closely. Of course, it is one thing for a wealthy, politically stable and relatively nimble country like the UAE to adopt this kind of approach. For others, the picture is far less straightforward. 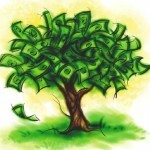 Many are hostages to fortune with resources compromised by factors they simply cannot control. What struck me most of all is that the world faces major challenges that it can only tackle together. So, while it is interesting to see a country like the UAE take the lead on food security and climate change, it will take a coordinated effort around the world if the broader problem is to be overcome. 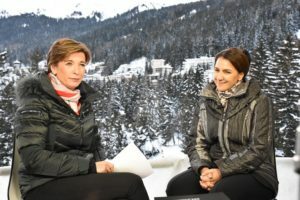 In a world apparently becoming more fractured, it seems more urgent than ever that forums like Davos are able to produce clear and actionable plans. I’m not entirely sure that was the case this time around. It will be interesting to see whether the upcoming World Government Summit in Dubai can deliver more tangible outcomes.